Rock House is a delightful, historic cottage just minutes from downtown Prescott. 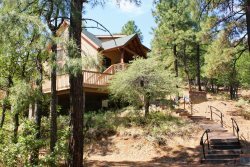 Rock House is a darling, historic cottage located just 1.8 miles or 6 minutes driving from downtown Prescott. This one bedroom property sleeps 4 guests with a queen in the bedroom, a queen hideabed (very firm) in the TV room and a single twin that can really be set up anywhere. The bedroom has a large walk in closet and lovely windows for views and light. This unique accommodation has 1 bathroom. It has a large, jetted, garden tub and a glassed in shower. The bathroom is interesting and airy with special stone flooring. The full kitchen features colorful tile and is completely stocked with dishes, pots, pans, everything for coffee and includes a dishwasher. The wood-grained cabinets with glass doors show off the copper back drop in this kitchen. A charcoal BBQ is provided for outdoor grilling. The living room is warm and cozy with a rock (of course) wood-burning fireplace and large, flat-screen, cable TV. The second flat-screen TV is just off the kitchen in the TV room. Comfortable, black leather couches and chairs surround the living room making long conversations around a crackling fire or movie marathons on TV a pleasant, relaxing experience. Rock House has a cabin feel with warm, wood floors and knotty-pine, vaulted ceilings. A one-of-a-kind rotating ceiling fan provides a breeze for warm, summer afternoons. Cheerful, unusual chandeliers are everywhere casting a an artful touch to the rustic-ness of all of the rock and wood. A washer/dryer is convenient for longer stays. Internet access brings a modern convenience to this Prescott gem. As pleasant as this is you will be drawn to the outdoor spaces with conversation areas everywhere. Should you sit in the front with the chiminea and view of the night sky? Or perhaps you'll want to relax among the large boulders and trees in back. The front porch might be nice for your morning coffee or evening glass of wine. The uneven surfaces and landscape could be challenging for the young and old to navigate. Please be careful of the many steps and paths that surround this property. Whether it’s a quick weekend getaway or your retreat for the whole summer, Rock House is a dream vacation rental in the historic heart of Prescott!